We all come across many inspiring stories in our life, but there are a few which can touch the deepest part of our soul. 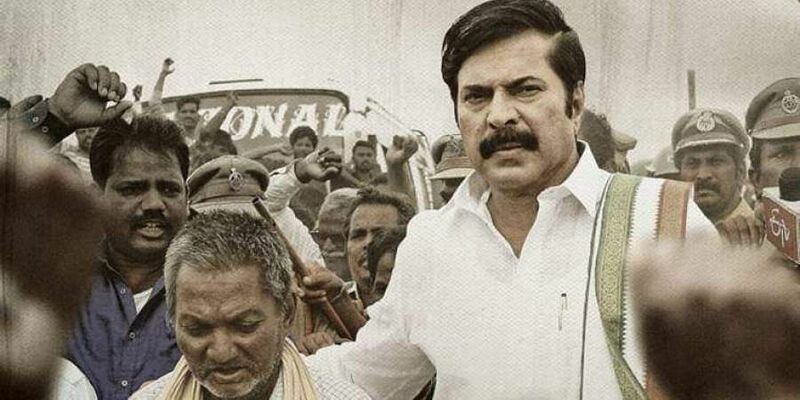 Yatra is one such emotional saga that hovers around a series of backstories from late Chief Minister, Dr YS Rajasekhara Reddy's 2003 padayatra, which turned out to be a significant milestone in the history of Andhra Pradesh politics. It's clear that director Mahi V Raghav strongly believed in the need to tell the story of a politician who championed the cause of the common man with his policies, that endeared him across political parties. The artistic passion with which the director worked manifests on screen and the film delivers exactly what it promises. Yatra takes off in Pulivendula, when YSR (Mammootty) assures support to an election aspirant against the wishes of party high command. He stamps his authority with political astuteness, skill and wins the election unanimously. Ever since, he keeps toying with the high command and gets involved in disagreements with its representatives. His party remains out of power for two consecutive terms and after some inner ramblings, he decides to set out on a padayatra, to get a first-hand experience of the people’s problems and their needs, and take steps to address them in earnest. Even though the high command hates his dominance, it is unable to ignore him due to his unmatched popularity in the Rayalaseema region. Using the backstories of the free power scheme, arogyasri, fee reimbursement scheme and minimum support price to farmers as a narrative, Yatra offers brief snapshots of YSR’s career and him getting elected as the Chief Minister for two consecutive times. The director has explored the reasoning behind YSR's political entry, his dream to become the tallest leader and his unwillingness to compromise on his notions. Toggling between reality and fiction in a procedural and personal manner around an event, the film is far from being a biographical drama that surrenders to the usual trappings of commercial cinema. It’s neither a biopic nor a propaganda film, but it makes a difference with surprising emotional depth, strong character arcs, and an affectionate nostalgia. The performances are top-notch, especially from Mammootty, who gets into the skin of the character and walks away with all the best lines and moments. Rao Ramesh, who plays YSR's confidant, KVP Ramachandra Rao, does a fine job too. Ashrita Vemuganti fits the bill as Vijayamma, while Suhasini Maniratnam and Anasuya Bharadwaj play their parts well. Also impressive are Prudhvi, Posani Krishna Murali and Sachin Khedekar. Jagapathi Babu makes his presence felt in a cameo. Penchal Das's rendition of Marugainava Rajanna, which has been on everyone's lips for a few days, sets off an emotional spin during the climax. At a little over two hours, Yatra is a film about one of the most influential leaders of our times and is a compelling watch for its emotional impact.